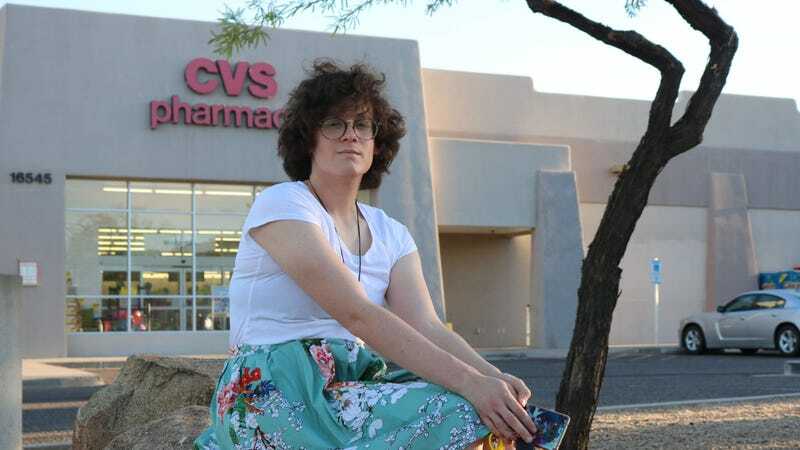 Arizona woman Hilde Hall has testified to a nightmare experience at a CVS pharmacy where she had gone in April to fill her first prescription to begin her hormone therapy treatment. Hall’s story comes just one month after an Arizona Walgreens pharmacist legally denied abortion medication to a woman who’d found out that her baby no longer had a heartbeat. After years of working to affirm my identity in a world where transgender people are questioned constantly about how well they know themselves, the pharmacist refused to fill one of the prescriptions needed to affirm my identity. Not only was she denied the medication, she says, the pharmacist refused to return her doctor’s prescription. She says her doctor called the pharmacist, who still refused to provide the medication, so her doctor had to call it into Walgreens. While it’s explicitly legal in Arizona for medical practitioners and pharmacists to deny emergency contraceptives and abortion pills based on moral and religious grounds, there are no specific laws concerning hormone therapy drugs, which is why it’s important for companies like CVS to self-regulate, ACLU of Arizona spokesperson Steve Kilar told us. And Hall’s is not an isolated case. Federal legislation looms. In April, Trump administration officials had announced that the Department of Health and Human Services will be revising an Obama-era rule prohibiting medical practitioners from denying treatment based on gender identity. Given Jeff Sessions’s undiscriminating and dependable hatred of most of his fellow humans, advocacy groups like the NCTE are bracing for the worst.